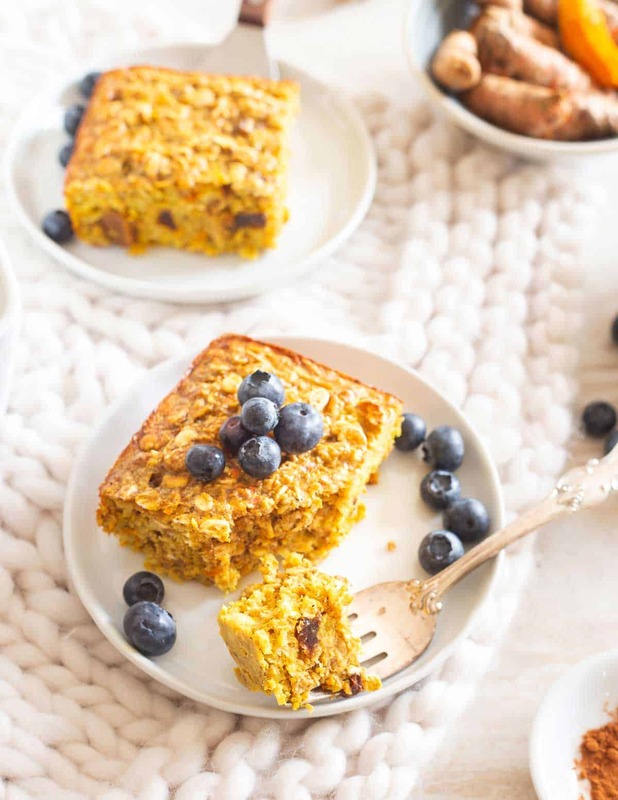 Baked turmeric oatmeal is studded with cinnamon and raisins for a healthy and hearty anti-inflammatory breakfast and easy to make ahead. I feel a little late to the turmeric game (it feels very 2018 to me) but as they say, better late than never, right? After making the Instant Pot coconut pork with turmeric rice a few weeks back I was left with quite a bit of fresh turmeric and rather than letting it shrivel up in my vegetable drawer (I may have done that a time or two before), I was determined to make use of it. So, be prepared for quite a few turmeric recipes in the coming weeks, this baked turmeric oatmeal being the first. Turmeric is part of the ginger family – not surprising as it looks just like ginger root in its fresh state just with orange flesh. Used most often in Middle Eastern and Asian cooking. It’s a powerful anti-oxidant that helps fight free radicals in the body. Believed to be a natural anti-inflammatory and help fight arthritis pain and indigestion/heartburn. Not a bad rap sheet for this ugly looking nubby thing, right? So if you’re wondering why you see turmeric in everything from lattes to stews and even ice cream, now you know. It’s like the new matcha powder. And as someone that never learned to love matcha (outside of this matcha mint chocolate chunk ice cream), I’m not mad about it. Can You Put Turmeric In Oatmeal? Yes, you can! 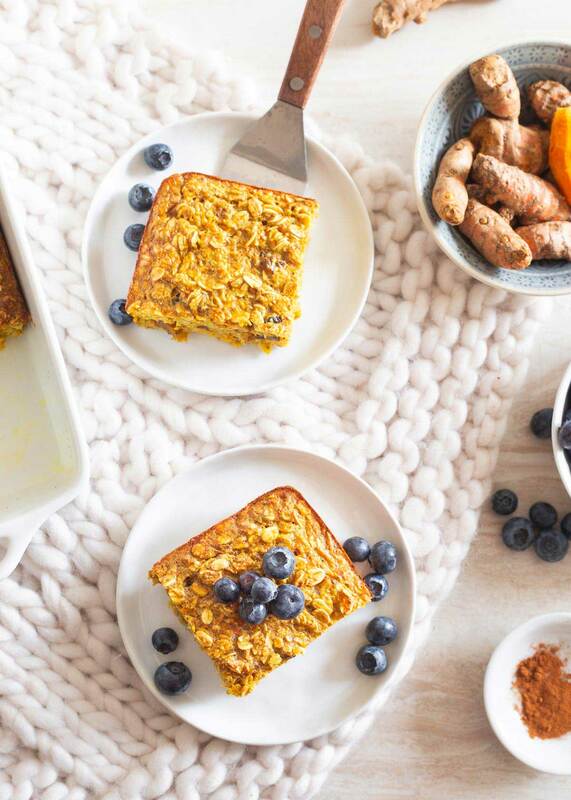 These turmeric baked oats prove it! 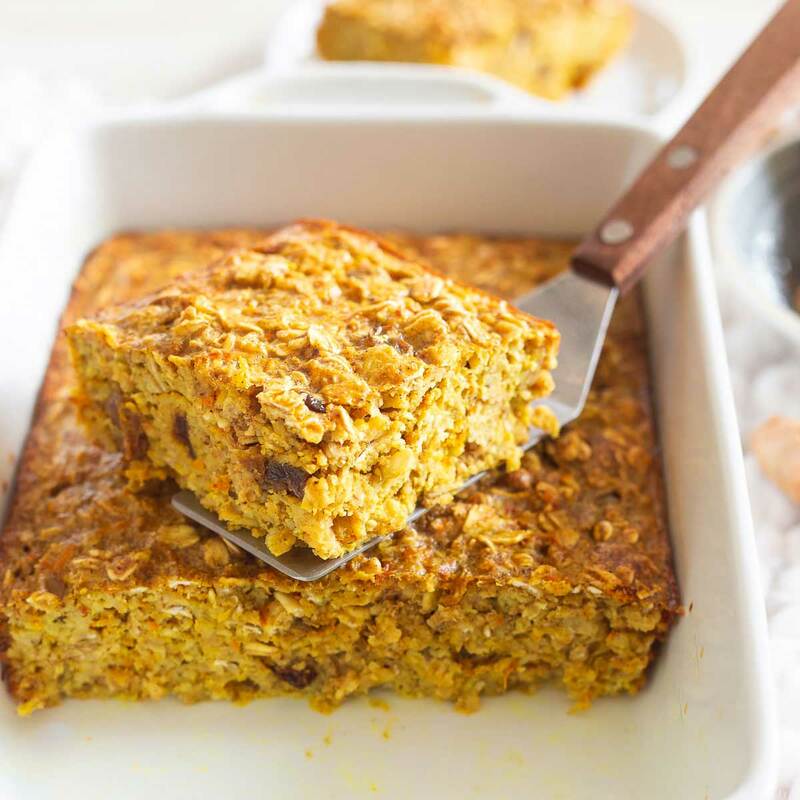 There are lots of recipes out there with dried/ground turmeric in fluffy bowls of oatmeal, sometimes going by aliases of “glowing oatmeal” or “golden oatmeal” but, I like these baked oatmeal squares even better. Because they’re a meal-prep rockstar. Baked oatmeal lends itself so well to batch cooking/baking. This recipe makes 6 servings, make it on Sunday and you can literally eat it all week long. If you’re someone who is always running out the door to work in the morning and struggling to fit in a nutritious healthy breakfast, this recipe is perfect for you. 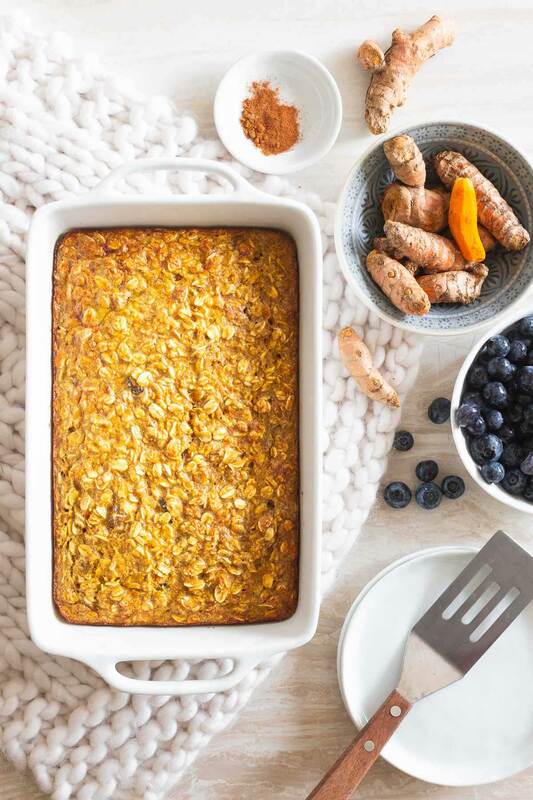 How Do I Make Baked Turmeric Oatmeal? Fresh turmeric has become widely available lately in most grocery stores. Look in the produce department right where the fresh ginger would be. Sometimes it’s sold loose while other times, it’s in a small clear plastic container and you get like 15-20 pieces (<– my predicament this time). If you can’t find it though, don’t worry because I give an option for using dried ground turmeric in the recipe notes. I used raisins in my version but I know that’s a divisive choice! Dried cranberries, figs, cherries, apricots, etc. would all be great so use whatever dried fruit you like. I almost used chocolate chips so I highly recommend that option too! The method is basic – mix wet ingredients in one bowl, mix dry ingredients in another, combine, mix and transfer to a baking dish. It’s really a very simple recipe! Can I Add Protein Powder? Yes, definitely! In fact, I did exactly that in this recipe. 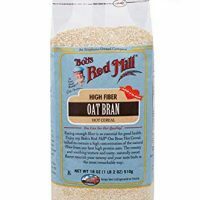 It’s noted as optional in the recipe because it won’t make or break it but I love adding protein powder to my oatmeal (or egg whites when I’m making stove top oats – try it!). I used this banana cinnamon vanilla whey protein because it’s great quality and the flavor profile went perfectly with the turmeric oatmeal. Feel free to use whatever protein powder you have and like. With the protein powder, the macro-nutrient breakdown of 1 serving of this baked oatmeal is 12g protein, 32 grams carbohydrates and 7 grams fat. That’s pretty well balanced in my opinion and if you ate it with some Greek yogurt for some extra protein, it’d be a really well rounded meal to hold you over until lunch. What Does Turmeric Oatmeal Taste Like? If I had to describe fresh turmeric I’d say it’s like a subtle ginger carrot taste that’s a bit on the floral side. 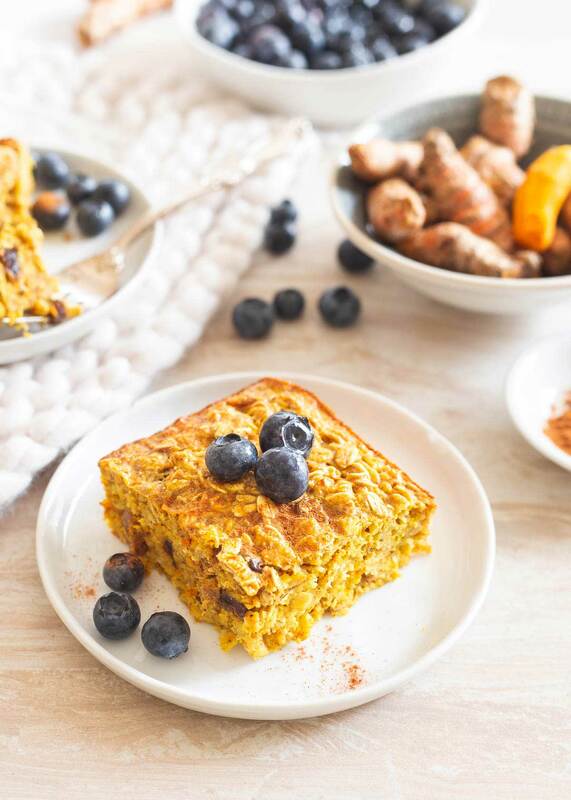 Turmeric doesn’t smack you in the face quite as much as ginger and when baked into oats, it’s light and refreshing yet hearty/savory at the same time. 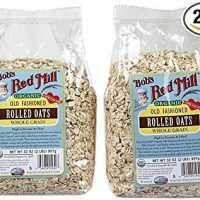 Combined with the cinnamon and banana in the baked oats, it’s really a lovely balanced flavor. The finished turmeric oats are slightly sweet, earthy and “breakfasty”. I like eating it with some fresh berries, a drizzle of maple syrup and a dusting of extra cinnamon on top. 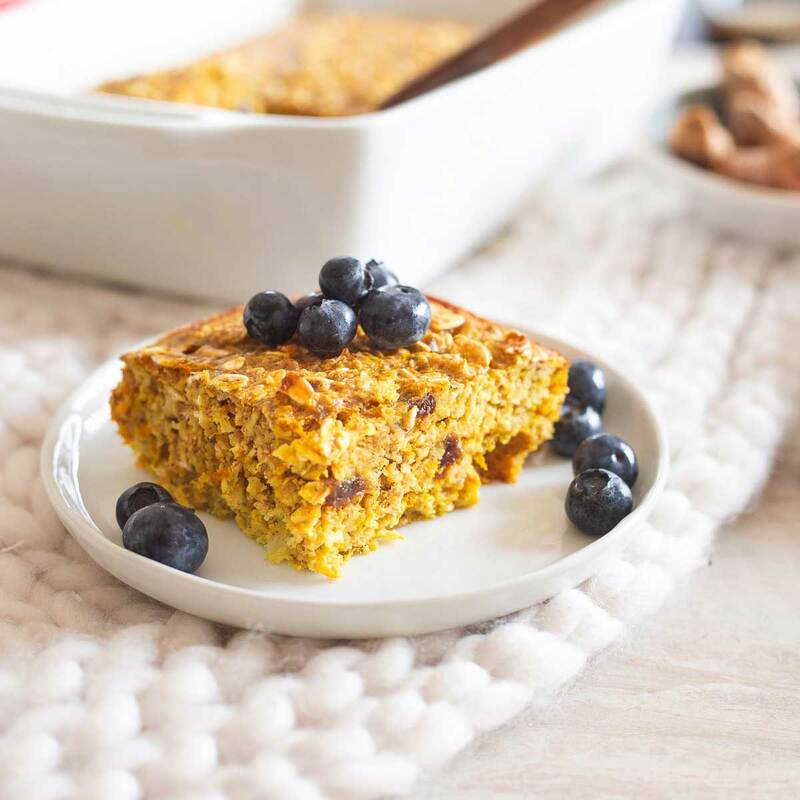 I love this turmeric baked oatmeal for its simplicity and ease because I’m all about the meal-prep lately. Ulysses loves that it does double duty as an anti-inflammatory breakfast to help his arthritis and tastes good. Hope you give it a try and customize to your liking! Preheat oven to 350°F and grease an 8x8 or similar sized baking dish. In a medium bowl, mash the banana. Add the turmeric, vanilla, eggs and milk and whisk until combined. In a large bowl, combine the oats, oat bran, baking powder, salt, cinnamon, protein powder if using and raisins. Pour mixture into the baking dish and bake for about 30 minutes until edges start to brown and pull away from the sides of the baking dish. Remove from oven, let cool then slice. Enjoy immediately or store in an air tight container in the fridge for up to a week. *You can use 1 1/2 teaspoons dried turmeric instead of fresh although flavor will be different. Fresh turmeric has a more subtle gingery/carrot taste. Fresh turmeric is widely available in the produce section of most grocery stores. 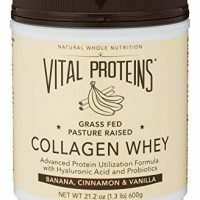 **I used Vital Proteins Banana Cinnamon Vanilla whey protein in this recipe but any unflavored or vanilla flavored protein powder would work well. Serving sizes of each protein powder vary just use 1 serving of whichever brand you use. Recipe will work without the protein powder just as well! As an Amazon Associate affiliate member, I earn from qualifying purchases. I need this for breakfast – looks so good!